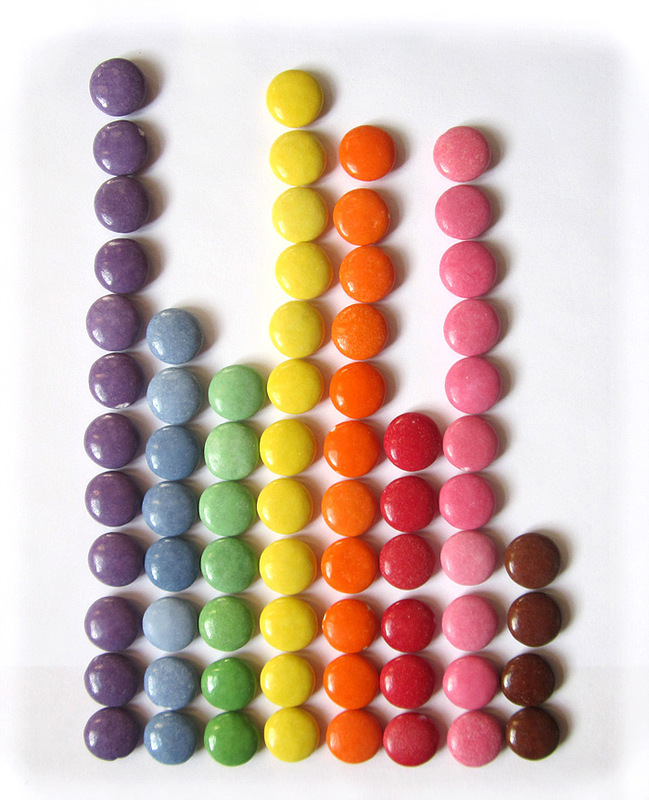 A bar graph of the colour distribution in a recently opened extra-large packet of Smarties. Like most people, I have an intrinsic (false) expectation that random distributions will result in relatively even numbers of each colour, and that the difference in purple and brown is meaningful in some way. But in a truly random system any variation (including one where purple leads by a large margin) is equally likely. Of course, a box of all reds is likely to trip some kind of Oompa-Loompa alarm at the Wonka factory, and they’ll toss me into a vat of chocolate and sing a catchy song while I’m being candy shelled. This is me and Puddles. 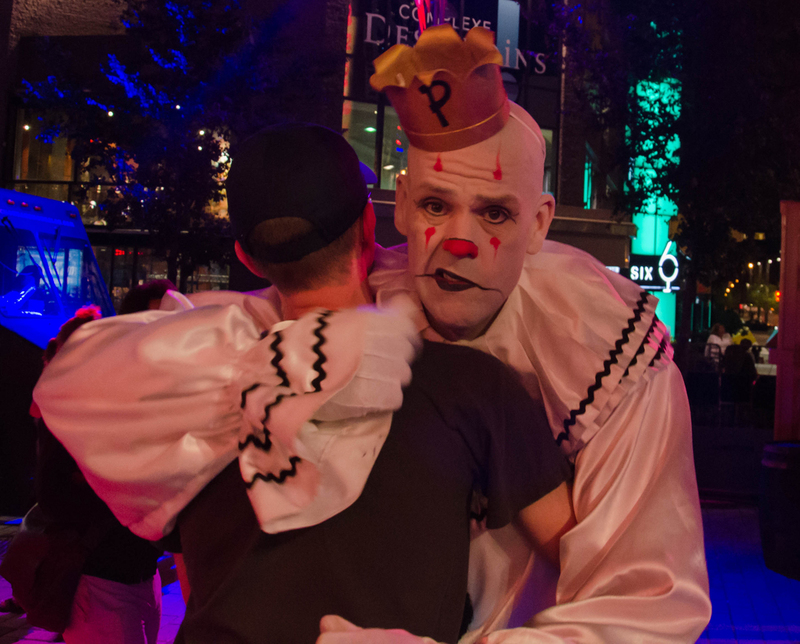 You might wonder how, precisely, I ended up being hugged by a famous clown. It was kindof his idea? He’s a terrific singer, by the way. 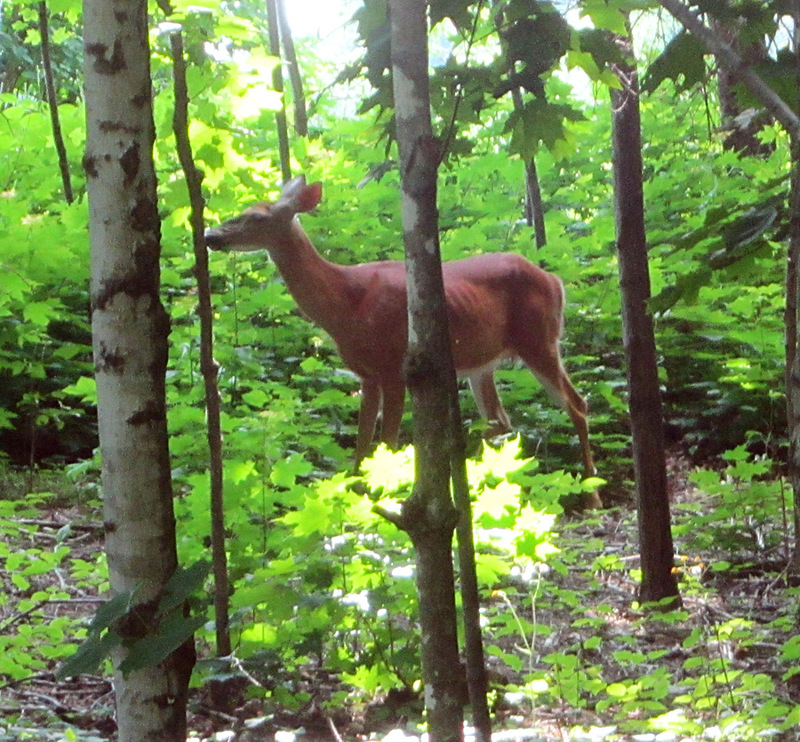 Got right up close to this beauty while hiking around the Gatineau Hills at Kingsmere. The Edge of Tomorrow – Neat-o! – This fun sci-fi flick has Tom Cruise repeating the same day over and over – a day where he and his platoon are wiped out by alien invaders. It could have gotten really repetitive, but clever editing and the director’s faith in the audience (thank you for not dumbing this down) let the film maintain it’s momentum while adding a neat sci-fi twist to familiar “storming the beaches at Normandy” film tropes. My only disappointment was that the cool music from the trailer wasn’t in the film! X-Men : Days of Future Past – Fun! – The X-Men are being wiped out in the future by menacing shape-shifting robots, so they send Wolverine back to the 70’s to change the timeline. It was nice to see nearly the entire X-Men family in one film – holy cameos – and everyone managed to get in on the action in one way or another. Quicksilver steals every scene he’s in – so much fun. If you’re a fan of the franchise you eventually have to catch this one. 22 Jump Street – Funny! – Basically the same premise as the first movie (infiltrate a school looking for drug dealers) but this film knows it’s a sequel and it’s full of self-referential humour and amusing setups. Some of (a lot of) the jokes are a little potty-level, but it’s a surprisingly intelligent film with lots of laughs. Imposter – So Messed up in a Good Way – This documentary wins all the creep-out awards. A Spanish man poses as a missing American adolescent and somehow nobody seems to notice? This is a super incredibly messed up story about the power of denial and how far you can get taking advantage of people’s hope – BUT THEN THERE’S A TWIST. About five minutes before it’s spelled out, I suddenly saw what was coming, and nearly fell off the couch. Watch this film. Orange is the new Black – Surprising – This Netflix original series is up for dozens of awards this season and deservedly so. Walking a very weird line between comedy and dark drama, the show alternates between fish-out-of-water “Martha-Stewart in prison” scenarios, to brutally honest tear-downs and violent attacks. Tons of excellent performances by excellent actresses with a lot of material to work with – really rich characterizations and relationships make this a riveting series. Attack on Titan – So Messed up in a Bad Way – Medieval humans are pushed to the brink of extinction by ravenous man-eating giants in this weird and twisted anime series. The animation is super ugly and disturbing, I think intentionally – but after the first few episodes I was hooked. There’s a lot of neat stuff happening here, particularly the spider-man suits, but the show is almost unwatchably paced – entire episodes are dedicated to explaining soon-to-be-foiled survival plans, major characters are eaten so often you’ll quickly stop caring for the ones left over, and the explanation for major mysteries are always teased but never revealed. After watching the entire first two seasons on Netflix, only to end in yet another unresolved cliffhanger, I’m not sure I want to watch any more. I have a kind of bystander fascination with Kickstarter. I’ve watched a lot of too-good-to-be-true projects crash and burn, heard horror stories of people miscalculating the costs of reward delivery, seen good projects fail and bad projects go through the roof. I’ve had some friends try their luck and with mixed results. Even the infamous DoubleFine Broken Age project – a sure thing funded at least 8 times it’s asking budget, ran aground and went begging to Steam for money to finish the game. I’ve pitched in small-potatoes cash on an handful of projects, mostly with hilariously terrible results. One author spent all the money on knee surgery and turned in his story two years after the deadline. Three projects didn’t hit their funding goals. One of them hit their goal, but I haven’t had an update in 8 months, they may be dead. In some ways, I see that the hurdles put in place by the old way of doing things (assuming the risk and paying for development of the project yourself, earning it back when you complete the project and sell it) was a kind of effective quality control gatekeeper. Well planned, large-scale commercial products backed by solid teams tend to find their own funding through traditional means. It seems like Kickstarter has laid the table for a kind of free-for-all for anyone with a (sometimes stupid) idea – and possibly little to no business sense, to make a big expensive mess. The danger in turning the established business model on it’s head is that anarchy isn’t any better. Although I only dream about living a life intense enough to need most of their stuff, I do sometimes find myself shopping at Mountain Equipment Co-op for things like raincoats and backpacks. I love their stuff – really high quality, fair prices, and I dig their sustainable philosophy and very Canadian values. Their slingback knapsack was my favourite bag to bring on adventures for nearly 7 years, exploring far-flung cities, local hiking trails, canyons, rivers (it had weatherproofed zippers!) and deserts. It was just the right size and super comfy, and seemed indestructible. After lots of wear and tear, the main zipper eventually popped loose from it’s stitching – I didn’t have the heart to throw it out since it was my favourite day pack. Finally, a friend insisted I bring it back to the store – they have a Rocksolid Guarantee on all their stuff – a lifetime promise to repair anything that breaks. I am crazy in love with MEC. I wouldn’t expect service like that from any other retailer.